About 15-odd trees, beautiful rain trees which were just spreading out and thriving, were cut down 3 years or more ago, to make way for the Jayadeva Circle flyover which was going to ease traffic and make a wonderful thing out of Bannerghatta Road. The flyover is yet to be completed and we live close to it, in a mess of dust and diverted traffic. Since the new cheap, sorry, chief minister took over (his house is deliciously meretricious concoction on the road parallel to the one on which our apartment building stands), work is “proceeding” on the flyover. This morning, I found that the tree right opposite our balcony, which has provided us with a lovely green view in the morning, is being hacked down. It provided shelter to SO many birds and goodness knows how many squirrels….it was a BEAUTIFUL thing and lifted my spirits each morning. I am VERY upset. More so because I am helpless. I saw it only after it was hacked irreparably. A few yards ahead, the road will narrow down because of the Mantri Elegance/Shopper’s Stop property; so why not spare this tree too? Of course not, hack it down…I can’t bear to go to the balcony any more. I know how Dogmatix felt. 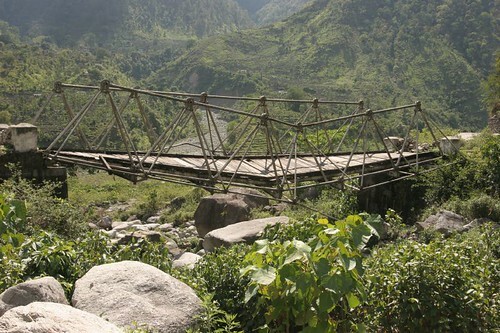 A front and side view of a bridge that had broken down on the alternative route we took from Munsiyari to Thal, via Jauljibi, in Uttaranchal. 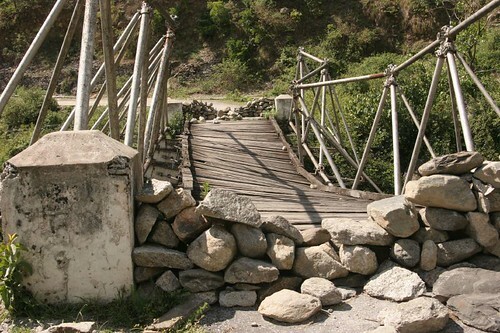 Luckily for us, a causeway had been opened by roadworkers nearby, otherwise, since the main route was also closed by a landslide 10 km from Munsiyari, we would never have got to our destination, Kausani. It made us ponder over the effort needed to keep the mountain roads in shape. 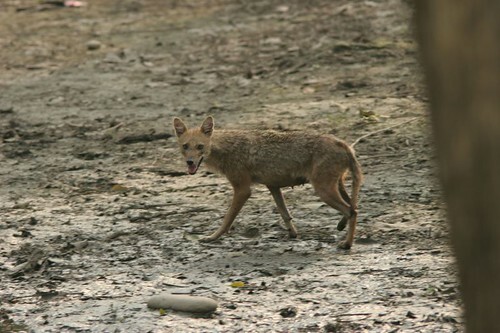 Our guide told us that this was a jackal, but kalyan thinks it could be a wolf. We need some positive id! …Oh well, Yathin has settled the issue now, see below! 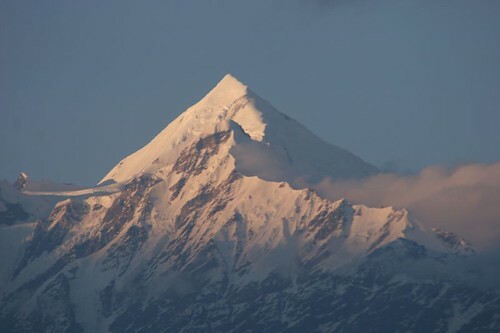 This was the view from the Zara Resort, where we stayed in Munsiyari, a town at the northeastern tip, hardly miles away from the Tibetan (Chinese) border on one side and the Nepalese on the other. This was the first time we had seen a glacier…its beginning can be seen on the left-hand-side of the picture. Until I learn how to post-process, I will be posting the pics are they were taken by Mohan. He has been pleasantly surprised, though, by the number of compliments he has been getting so far! I had found that putting them through the shortest cycle on my washing machine worked…but this time I have come back with so much of the Desh ki Dharti (soil of the nation) sticking to them that even after this process, they are still not WHITE. 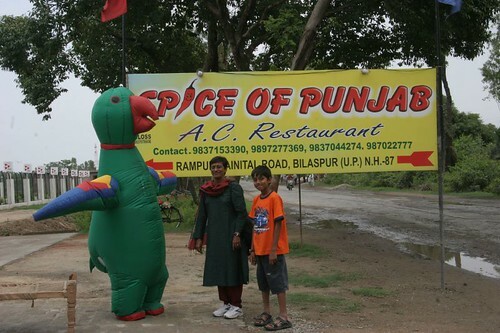 A perfect way to end a birding trip…a never-before sighting of the Pseudopsitta punjabspicis. I have given the name with some inputs from Amogh and Sudhir. How many birders can claim to have found a new species within 3 months of taking up birding? This majestic bird was presumably looking out for prey on the river. 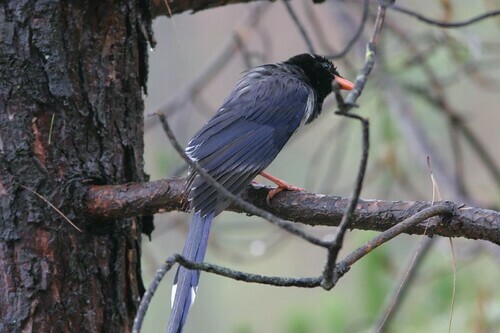 This beautiful, ornate bird, with a long tail that feathers out in black, white,and grey-blue, was caught in the rain and waslooking quite huddled and miserable! 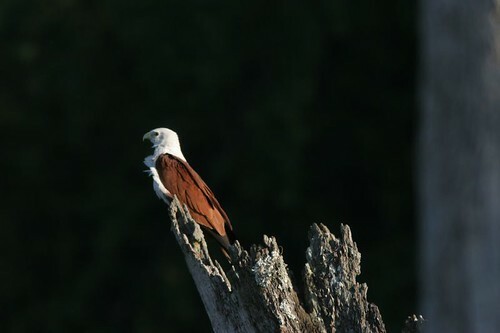 There were four or five of them dancing on the conifers outside our cottage at Munsiyari in the mornings and the evenings…quite an entertainment! He and I make a very funny team. He can’t spot the birds and I can’t take the photos…so we need each other! All the other guests were greatly entertained by the sight of us in Uttaranchal, shrieking (in suppressed voices of course, for fear of scaring the birds) “Look at that!”(me); “Wait! Let me get there!” (him); “Did you get that?” (me); “The #$^* bird flew away!” (him)…and scrambling from place to place! Long may our youngsters live! I am always amazed at the helpfulness of today’s youngsters…I only hope we were as nice to OUR elders as this new generation is to us. sainath saw my post on learning and has just spent over an hour on the phone, walking me through the process of uploading pics to Flickr and posting pics on LJ. I hope you get the course of your choice, and I hope I get to boast, in a few years’ time, about knowing you as a young man! For them, I suppose, it’s all so simple! You are currently browsing the Deponti to the world blog archives for May, 2006.